You know sugar is bad for your health. And of course, feeling unhealthy can make you feel unattractive. But did you know that sugar can affect your appearance far more directly? I'm not just talking about weight gain and acne — though those are factors. Sugar can have a significantly detrimental effect on your skin, making you look years older than you are. In fact, some research shows that years of excessive sugar can actually be worse for your skin than years of sun damage. On average, people are consuming 140 teaspoons of sugar (2,240 calories) a week — nearly three times the experts' recommendation to cap consumption at 49 teaspoons. Those who fall into this pattern may enjoy their treats now, but they have a lifetime of drier skin, wrinkles, sagging skin, and possible tooth decay ahead of them. Eating sugar increases the degradation of elastin and collagen, making it hard for skin to maintain its youthful smoothness. This occurs, in part, because sugar increases insulin dramatically, leading to inflammation or heat. While you can use creams and serums to try to help collagen and elastin bounce back, you'll have far better results if you slow its breakdown in the first place. When sugar builds up in the body, it can latch onto proteins, such as collagen. This can make them stiff and disfigured. It also leads to the creation of advanced glycation end productions, appropriately known as AGEs. AGEs, as you would expect, contribute to the appearance of skin aging. They're commonly found in diabetics, so their link to a high-sugar diet is not surprising. And while we tend to focus on the skin, let's not forget our teeth. 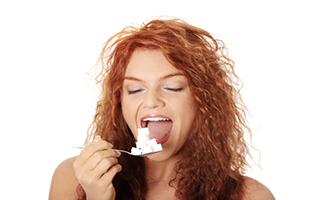 Sugar is a major contributor to tooth decay. It can cause teeth to become discolored, loose, or even to fall out. According to Deputy Chief Dental Officer Henry Clover, "Teeth provide support for your lips and cheeks, and missing teeth may cause your face to prematurely sag and wrinkle, adding years to your appearance. Over time, missing teeth may also lead to bone loss in the jaw. Thin jaw bones can alter the profile and shape of your face, further compounding the sagging and hollowing effect of your cheeks." Those are some serious downsides. And sometimes, our concerns for our vanity can motivate us where concerns for our health cannot. Sugar’s inflammatory and destructive effects are well-documented, yet it seems to be in almost everything we eat. Try to considerably reduce your consumption of processed foods to minimize your intake, and always read nutrition labels to avoid sneaky additions. Better yet, have the majority of your diet come from whole, unprocessed foods. Put your healthy teeth to work crunching away on some vegetables! In addition to the inside/outside approach to better skin, consider an antioxidant-rich recovery tool such as the Système 41 Night Treatment. Several pre-diabetic patients of mine who began cutting back on sugar and simultaneously using the Night Treatment, report considerable improvement after only one month.